Did you know that in the Microsoft Garage there is a Workbench with 16 free tools you can download and use? 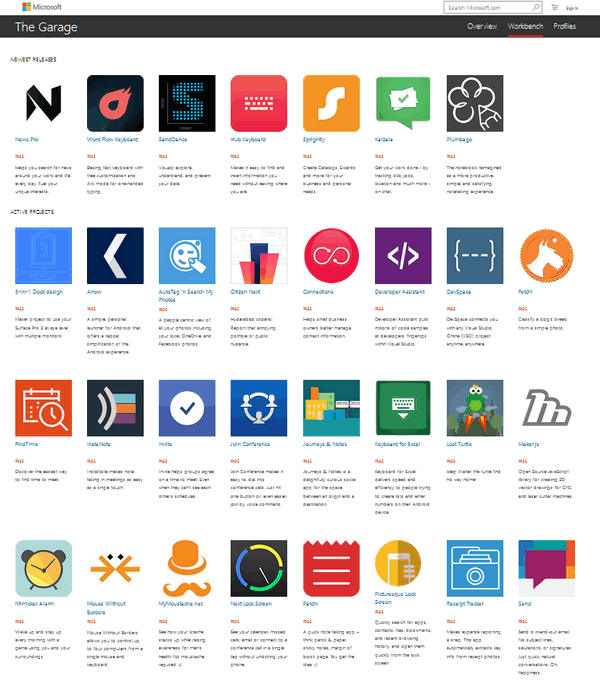 Indeed there are over 50 tools – but we really doubt that all 100% of you will find all 100% of them useful or even fun. Still they’re free and you know what EB always says: “Whatever is free is better than that whatever you have to pay for.” You have to forgive her, she’s a bit out of touch. She’s still wants to wear bobbie socks and to go a malt shop with Dobie Gillis. Because – due to space limitations in this newsletter – you will not be able to see all the selections in Microsoft Garage screenshot, so we’re going to list some of them for you, but there’s a lot more stuff parked in the Microsoft Garage, I tells ya! AutoTag ‘n Search My Photos – A people centric view of all your photos including your local, OneDrive and Facebook photos. Plumbago – The notebook reimagined as a more productive, simple and satisfying notetaking experience. Citizen Next – Hyderabad citizens! Report that annoying pothole or public nuisance. Collaborate – Bring your white boarding experience to the digital world using Collaborate. Floatz – See what people nearby are talking about and anonymously share your own thoughts and pictures. Journeys & Notes – A delightfully curious social app for the space between an origin and a destination. Are you getting the picture yet? By the way, those are Microsoft’s descriptions not ours. Go see for yourself, I tells ya! If you’re up to it and you’d like to learn more, we’re up to giving you the link. Go visit the Microsoft Garage and see what’s on the Workbench! Well as my father in-law used to say … If it’s free , it’s worth saving up for. I am pleased to see that ‘Free Gifts’ wasn’t mentioned, it is one of the most ridiculous use of words seen in modern day ‘cool speak’ with advertisers, et al. A gift is free, nothing else, I have never met or heard of anyone to date who has paid for a gift.